Catholic survived a very close pool match with Teurlings Catholic to advance to the finals of and then win the Catholic Duals on Saturday. The Bears defeated the Rebels 37-34 to win Pool A, while Brusly went through some tough matches against Zachary, Live Oak, Hoover, AL and East Ascension to win Pool B. 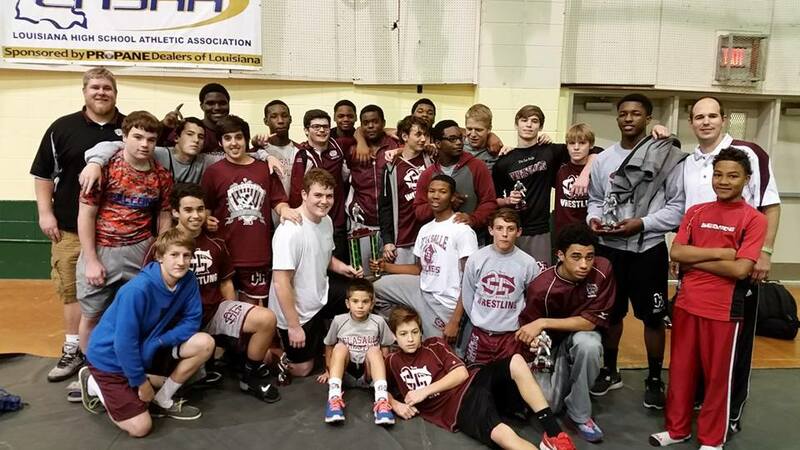 And while dual meet victories do not necessarily dictate how teams will fare in a tournament format, Catholic's 55-9 finals victory over Brusly makes the Bears the current favorite to take the Greater Baton Rouge Championship trophy back to Catholic. After the Catholic-Teurlings Catholic match, though, Teurlings Catholic lost a 39-39 match to McKinley via criteria, and hence only placed third in the pool. The Rebels went on to defeat Hoover 45-30 in the third-place pool-placers match. Live Oak defeated McKinley 52-30 in the match of second place pool-placers and St. Amant defeated Zachary 45-28 in the fourth place pool-placers match. East Ascension and Hahnville placed fifth in their pools but did not compete against each other in the championships round. Zachary's Sam Johnson remained undefeated, wrestling at both 145 and 152 pounds. ¹ For readers new to the Louisiana Wrestling News Website, the footnoted young men know that if a specific loss is worth mentioning, then they are doing something right overall. De la Salle's only had one champion and three third-place finishes, but notched 19 pins in the consolation rounds to win the 2014 Trygg Memorial Tournament at Grace King on Saturday. Joe Clark took the title at 182 pounds for the Cavaliers and Glen Gebo (132), Conrad Wyre (145) and Nick Guthrie (220) placed third. Jesuit's "B" squad placed second and had champions in Adam Larriviere (106), Austin Ashburn (113), Eli Larriviere (120) and Max Grosch (138). Other winners were Joseph Davis-Lucas of John Ehret (126), Matthew Matherne of Ouachita Christian (132), Timothy Hilliard (145), Jacob Spohrer (195), Bobby McNeil (220) and Daniel Revolta (285) of Pearl River, Brandon Cowell (152) and Kaleb Faul (160) of Dutchtown, Chase Menendez of Destrehan (170), Jacob Spohrer of Pearl River. Against some stellar competition from Alabama, Florida and Georgia, teams from Jesuit, Rummel and St. Paul's each placed in the top ten of the 2nd annual South Walton Border Wars in Destin, Florida, and each had a titlist. Blake Mateau won the 106 pounds weight class for the Raiders, Colin Francis the 220 pounds weight class for the Wolves, and Guy Patron, Jr. and Dominic Carmello won at 195 pounds and 285 pounds, respectively. Patron, Jr. was named the Outstanding Wrestler in the heavier weight classes for his performance. The team title went to Vestavia Hills, Alabama, who scored 272 points, 1/2 point more than Springstead and Lake Highland Prep. of Florida, who tied for second place. (Vestavia Hills is scheduled to compete in the 2014 Trey Culotta Invitational at Brother Martin on December 22nd-23rd.) Jesuit placed fourth while Rummel and St. Paul's placed ninth and tenth. Guy Patron, Jr. is presented the Outstanding Wrestler award by South Walton coach Nick Cary. The somewhat depleted Jesuit Blue Jays placed fourth with 226 points. Winning championships for the Crusaders were Luke Cotton (106), Steven Shields (113), Paul Klein (132), Mason Williams (145) and Travis Viener (195). Stephen Rumney (120), Taylor Gambill (126) and Blaine Eisensohn (138) placed second, Seth Johnson (152), Danny Evans (160), Pierce Williams (170) and Matthew Montalbano (285) placed third and Jacob Clapp (22) placed fourth.